A family life drama-comedy with spectacular acting performances by a dream cast, Terms Of Endearment is a masterpiece of authentic emotions. In Texas, Aurora Greenway (Shirley MacLaine) has always been slightly paranoid and definitely overprotective of her only daughter Emma. Aurora was widowed at a young age, leaving her relationship with Emma as the one true connection in her life. When Emma (Debra Winger) grows into a young woman and decides to marry school teacher Flap Horton (Jeff Daniels), Aurora certainly does not approve, believing Flap to be unworthy. Around the same time, retired astronaut Garrett Breedlove (Jack Nicholson) moves into the house next door. A party-loving, womanizing and free-spirited bachelor, Garrett is a man denying his age. Emma and Flap push ahead and get married anyway, and eventually start a family and move to Des Moines. As the years pass Aurora remains in close touch with her daughter, the two sharing their lives over frequent phone calls, and despite plenty of arguments and no shortage of agitation, their love and commitment to each other never wavers. Seeking physical closeness, Aurora finally works up the courage to start a relationship with Garrett, about 15 years after he became her neighbour. With three kids to raise and Flap's limited earning power causing a financial burden, Emma's marriage starts to seriously fray, and both she and Flap are subjected to extramarital temptations. The threat of another relocation and a serious illness are yet to come. 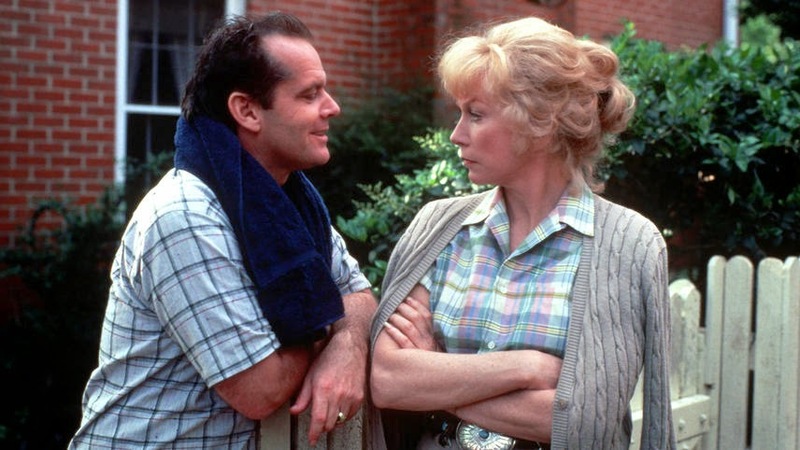 Directed and written by James L. Brooks in his directorial debut, and based on the Larry McMurtry book, Terms Of Endearment is a perfectly polished gem. For the full 131 minutes, not a scene is wasted, Brooks trusting his audience to keep up as the film gallops through the years using short, often funny and frequently poignant scenes. Chronicling the bond between Aurora and Emma from birth and through about 40 years of life, Brooks nails the ups and downs that define the unique cycles of frustration and happiness between mother and daughter, with undying love providing the sturdy foundation upon which two lives are lived. Brooks' singular achievement is in creating uniquely memorable characters and then treating them with utmost realism. Aurora, Emma and Garrett are a simply unforgettable trio, three people living life on their own stubborn terms but yet behaving fully within the normal rules where selfishness, sacrifice and life's surprises require a steady stream of critical decisions. There are no heroics in Terms Of Endearment; just happiness and heartache generated by the life's little successes and failures. And because laughs and tears punctuate life's milestones, Brooks includes plenty of both. The emotions are always there, but even at the darkest moments they rarely veer towards exaggerated agitation. In a peak moment of frustration Aurora does let loose at a hospital nurse station, but it's a scene that is equally funny and heartbreaking, capturing a devoted mother willing to move mountains for her daughter. Terms Of Endearment features astounding acting from the three principals. Shirley MacLaine and Jack Nicholson deliver some of their best work in their long and celebrated careers. MacLaine won the Best Actress Academy Award for what may have been her last great performance, bringing to life Aurora as a proud woman of the South dealing with the changing times and her own evolving needs. Nicholson took a step back from the madness and murderous urges that had began to define him after The Shining and The Postman Always Rings Twice, and nabbed the Best Supporting Actor Academy Award as Garrett the astronaut, a man determined to turn his past celebrity into a life of irresponsible pleasure. And Emma was undoubtedly Debra Winger's finest on-screen moment. Winger celebrates Emma as a feisty woman full of love, laughter and a singular determination to meet life on her own terms while forging friendships, sharing every moment with Aurora and adoring and tolerating Flap in equal measures. It's a performance for the ages, and Winger was also nominated as Best Actress but lost out to MacLaine. In addition to Daniels, Danny DeVito as Aurora's long-time admirer and John Lithgow as Emma's amorous banker round out the cast. Towards the end of Terms Of Endearment, Emma and Aurora share a moment. It's a brief locking of the eyes, without a word being spoken, Winger and MacLaine pouring their characters into a few seconds representing a lifelong bond, a breathtaking ending, a sorrowful beginning, a heartfelt thank you, and the meaning of love itself. It's an unforgettable instant in an enduring treasure of a movie.